What Is a Coriolis Flow Meter in O&G, and How Does It Work? Within the oil and gas industry, there are a number of different options for metering flowrate. 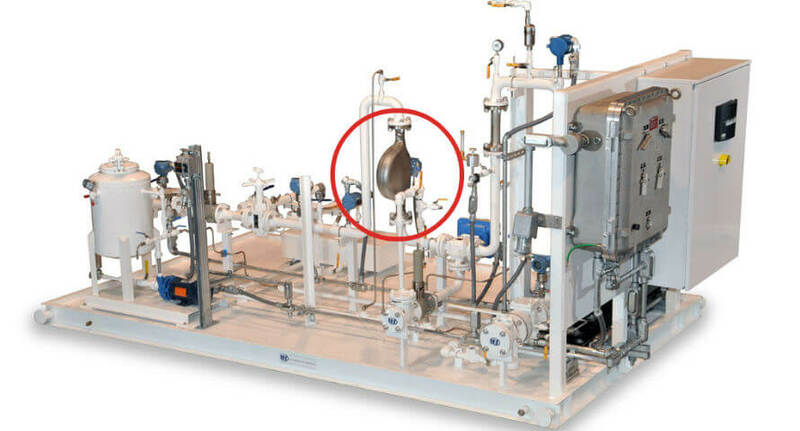 Over the years, Coriolis flow meters have become increasingly popular for liquid and gas measurement among oil and gas skid manufacturers and users. Although the initial costs for a Coriolis flow meter are higher that some types of metering, the accuracy, speed, measurement of mass rather than simply volume, and their low maintenance costs are driving the growing demand for Coriolis flow meters. Coriolis mass flow meters work using the inertia caused by fluid or gas flowing through oscillating tubes. That inertia causes the tube to twist in proportion with the mass flow rate, and this twisting is measured with sensors to generate a linear flow signal. The first patents for meters based on this concept were granted in the 1950s, but it wasn’t until the 1970s that the first industrial versions of Coriolis mass flow meters were produced. How does a Coriolis Flow Meter Work? Originally Coriolis flow meters were made from a single thin-walled tube that had been shaped into a curve. Issues with vibration problems were eliminated by switching to thick-walled designs that are commonly made with two tubes. These updated designs require less power and are highly durable. Now there are a variety of shapes and styles available for different applications, but they share the traits of high accuracy and need for little maintenance. In two-tubed Coriolis flow meter designs, a magnetic coil is used to cause the tubes to vibrate in opposition. Magnetic and coil assemblies attached to both flow tubes at their inlets and exits act as sensors. A magnetic field is then created by the magnet, and as the coils pass through this field, they create a sine wave. When nothing is passing through the Coriolis meter, the sine waves at the inlet and outlet are in phase together. Flow through the tubes causes the tubes to twist in proportion to the mass flow through the tubes. The sensors detect the phase shift which is effectively the time difference in the sine waves between the two sensors. That difference in the phase shift indicates the mass flow rate. There are several reasons why Coriolis type flow meters are increasingly in demand. The key factor is they are the most accurate type of flow meter. The lack of moving parts in Coriolis designs means they don’t have the maintenance or wear issues that other types of meters experience, and flow meter calibration is needed sparingly. Mass flow metering is better than simple volumetric measurements for many applications. Materials that are sold by weight rather than volume, for example, benefit from the more accurate Coriolis measurement. Oil and gas measurements are highly suited for Coriolis flow measurement since the value of petroleum products is based on the heating units rather than the volume. 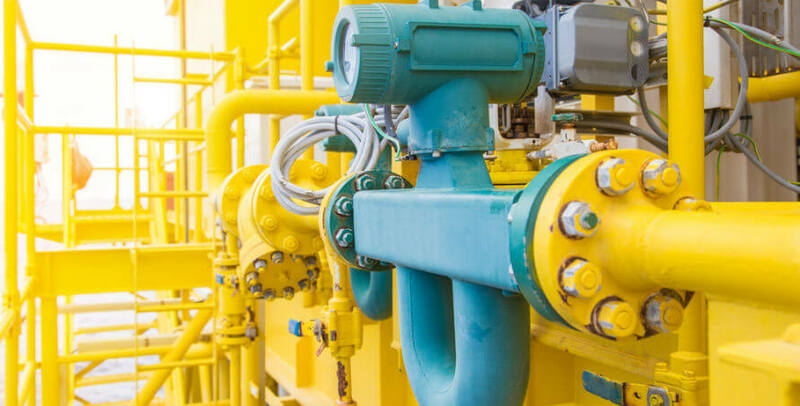 Mass flow metering is particularly important when measuring gases since temperature and pressure have a greater effect on gases than they do on liquids like crude oil. Coriolis mass flow meters provide extremely accurate measurements of both liquids and gases, regardless of heat, the speed of flow, and line pressure. This has helped to spur the use of more Coriolis gas flow meter systems in the petroleum industry. Learn more about the lease automatic custody transfer unit by IFS. Our modular process systems are modular, engineered-to-order, and shipped ready to plug in. Coriolis mass flow meters are the most accurate type of meter, easily outpacing differential pressure (DP) metering devices. Magnetic flow meters have an average accuracy of 0.5 percent, Coriolis more typically achieve 0.1 percent accuracy over a mass flow range of up to 100:1. This type of accuracy is understandably highly desirable within the oil and gas industry where the products are so valuable, and there are often multiple stakeholders with interest in the accuracy of the custody transfers. Another reason for the recent growth in the use of Coriolis mass flow meters is the increase in the variety of options available. In the past, Coriolis mass flow meters were only available in smaller sizes but, more recently, manufacturers have begun offering a wider range of sizes and shapes designed for a variety of applications. Where Did the Coriolis Name Originate? Coriolis meters are named after the Coriolis effect, which is a phenomenon that was originally described in a paper by Gaspard Gustave de Coriolis in 1835. This French mathematician observed a mechanical principle in which an object moving within a rotating system will seem to experience a deflection perpendicular to the axis and direction of motion. Coriolis based his observation of this effect on the laws of motion that had been described by mathematician and physicist Sir Isaac Newton more than a century earlier. Ironically, there is some disagreement as to whether Coriolis mass flow meters actually work due to the Coriolis effect. Many experts consider Coriolis meters to operate based on the effect of inertia, rather than the Coriolis effect. Fortunately, regardless of how the science behind this technology is described, it is well documented that Coriolis mass flow meters do work and that they are highly effective and accurate in a range of applications and operating conditions. For more information about the range of Midstream Oil and Gas process systems that IFS manufactures, contact us today!